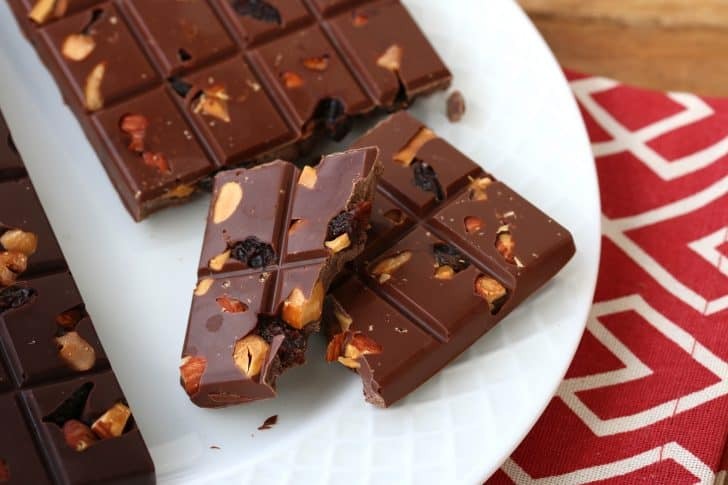 Replicate your favorite rum raisin nut chocolate bars, it’s super easy and SO delicious! Growing up in Stuttgart, Germany I lived close to the headquarters of Ritter Sport, one of the best chocolate manufacturers in the world. The other day I was craving one of their chocolate bar flavors that I hadn’t had in years: Rum Trauben Nuss. Rum raisin nut. The craving struck me from out of the blue and I hadn’t even thought about that flavor in a very long time. But at that moment I had to have it. (Such is the nature of chocolate cravings, right?) The bad news: There was no where to buy it without having to wait a few days for it to be shipped. The good news: I had everything I needed to make it myself and though the craving would have to wait a bit, the chocolate would be ready within just a couple of hours. Score! Two keys to making rum raisin nut chocolate taste amazing is to soak the raisins in the rum for several hours. The other key is to toast the nuts as that is what brings out the most flavor. Any chocolate works well. This time I made both dark and milk chocolate versions and it also tastes great with white chocolate. Pick your favorite! You can use any shape of molds you like, including individual bite-sized molds. I’m using standard-sized silicone chocolate bar molds. No matter the shape, you’re going to love this chocolate! Soak the raisins in good quality rum. (Ritter Sport uses Jamaican rum but use any rum you like.) Toast the nuts in the oven until lightly browned and fragrant, let cool, then coarsely chop. Hazelnuts and almonds are both terrific choices, use whichever one you prefer. I’m using silicone chocolate bar molds. They’re easy to clean, easy to release the hardened chocolate and of course reusable. Divide the soaked raisins and toasted nuts between the two chocolate molds. Microwave the chocolate until melted. Spoon half of the chocolate into each mold using the back of the spoon to spread it evenly. 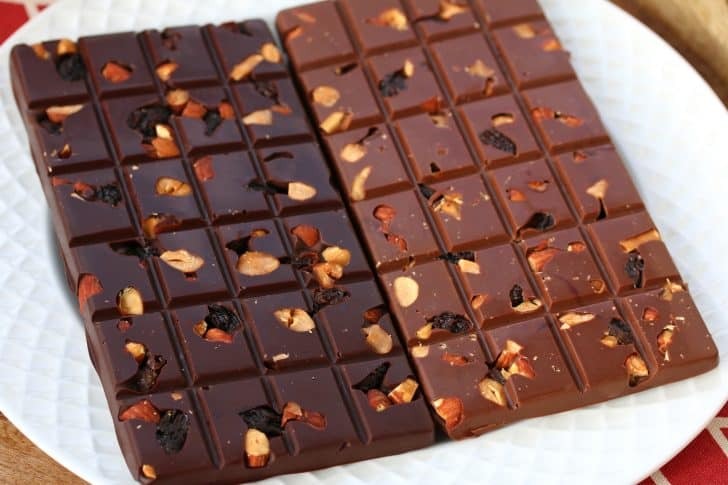 Chill the chocolate bars for at least 2 hours or freeze until fully set. 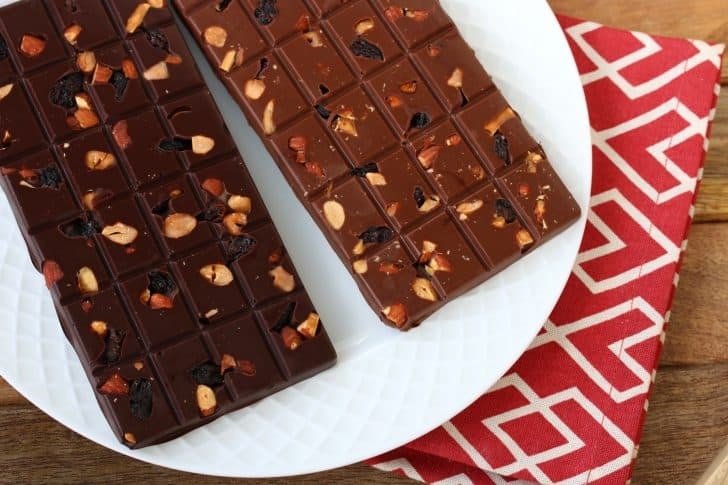 Tip the molds over and gently push to release the chocolate bars. 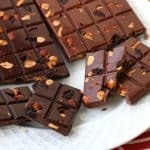 Replicate your favorite rum raisin nut chocolate bars - it's super easy and they're incredibly delicious! 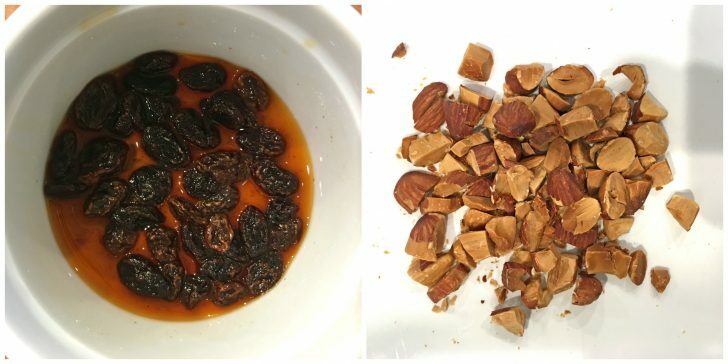 Soak the raisins in the rum for at least 4 hours. When ready to use, remove the raisins and shake off any excess rum. Distribute the soaked raisins and toasted nuts into two 3 ounce silicone chocolate molds. Note: You can use any shape and size of molds you like and double, triple, etc. the ingredients accordingly. Place the chocolate in a dish and microwave it until melted, giving it an occasional stir. Spoon half of the chocolate into each of the chocolate molds and use the back of the spoon to evenly spread it. Refrigerate the molds for at least 2 hours or freeze until fully set. Turn the molds over and gently push to release the chocolate bars. Makes two 3-ounce chocolate bars. What a tasty treat! I love that you can use hazelnuts or almonds! This is such a unique recipe! 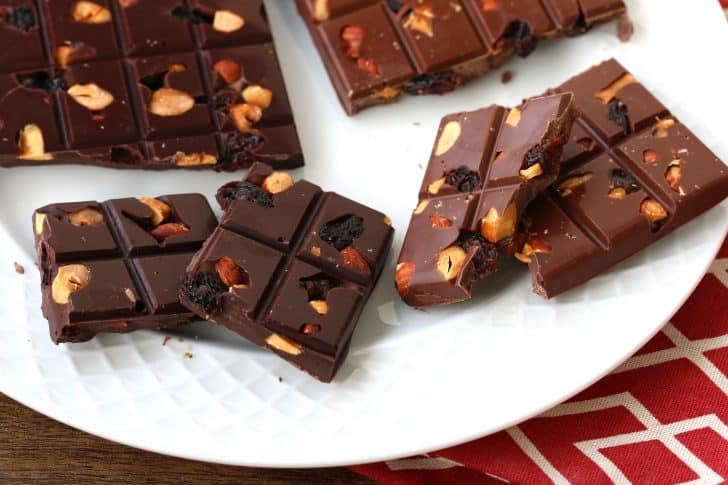 These homemade chocolate bars look simply divine! My kiddos will have a ton of fun making them with me! These look fantastic. I know they wouldn’t last too long around me. This is calling my name! Would love to try this! Ach so! Kommen sie aus Stuttgart? wirklich? So you must speak Schwabisch? 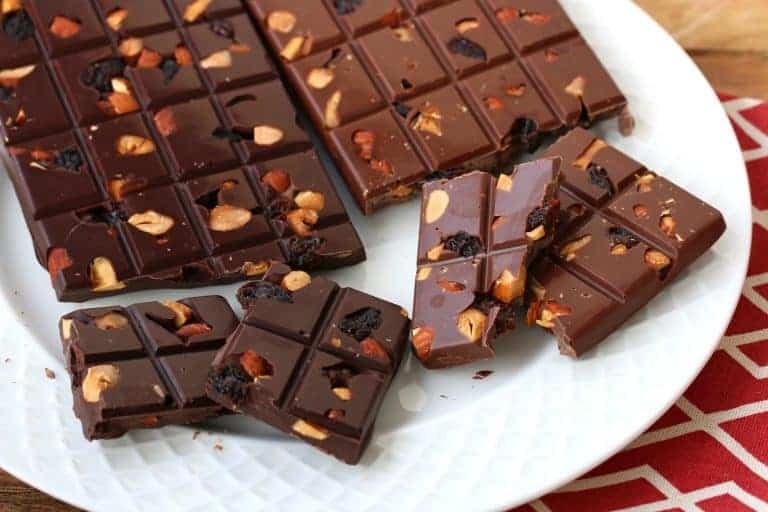 :-) I have never made homemade chocolates – need to get a mold. That would be awesome! Something to look forward to once I am done with my dietetic internship (aka. modern day slavery). The light at the end of the tunnel is still far, but I think I see something. Vielen Dank fur die (der or das?) Rezept! looks fab! can they be made in bigger molds? Thanks, Judi! Absolutely, they can be made into any shape or size, just double or triple (etc.) the ingredients accordingly. Oh my husband is going to love this! Thank you.